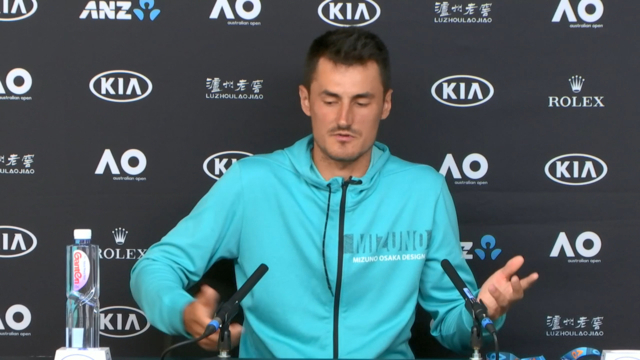 Bernard Tomic has denied threatening Lleyton Hewitt’s family and called the Davis Cup captain a liar for suggesting he would do something like that. Despite admitting to threatening Hewitt over email, Tomic denied threatening the family of the former world No.1. “I have never threatened his family,” Tomic told the Herald Sun. “Nice, Lleyton. To think how low of a person you actually and (it’s) why the Australian public never liked you. The comments come after Hewitt sensationally claimed Tomic had threatened him and his family, while also blackmailing his former Davis Cup teammate. After losing his doubles match yesterday, Hewitt said he is no longer on speaking terms with Tomic following alleged abuse at the hands of the Wimbledon quarter-finalist over the past year or so. “Both (physical and verbal) — blackmail and physical,” Hewitt said. Hewitt said he wasn’t worried by the Tomic’s abuse but more frustrated by the time and effort he put in trying to make him a better player.